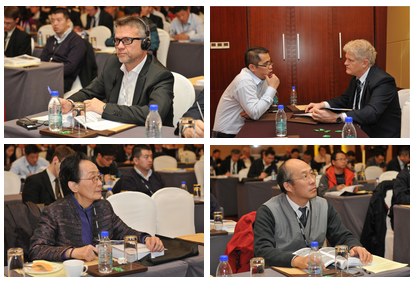 The China Aviation Journey 2013 was successfully held in Beijing during Dec. 3-5, 2013, jointly organized by Chinese Society of Aeronautics and Astronautics (CSAA), co-organized by AVIC Beijing Institute of Aeronautical Materials and AVIC Beijing Aeronautical Manufacturing Technology Research Institute, hosted by Galleon （Shanghai）Consulting Co., Ltd. More than 160 experts and business representatives from over 90 units attended the forum, including the CAAC, Chinese Academy of Engineering, Foreign Embassies in China, AVIC, COMAC, ACAE, Northwestern Polytechnical University, Centeral South University, Boeing , Airbus, domestic and foreign aircraft manufacturing plants, aeronautical materials R&D and enterprises, institution of higher learning and industrial societies. Totally, 32 speeches were delivered at the conference, Litong ZHANG, Academician of Chinese Academy of Engineering made the keynote speech in which she mentioned that china domestic matrix composite technology had reached international advanced level, and will eventually be used for domestic aeroengine. Expert from CAAC thoroughly analyzed the current situation of China airworthiness certification process in detail. Jibao LI, Deputy General Manager, ACAE, expatiated the demand for material and forming technology of Chinese commercial engine in his speech titled “Demands of Commercial Aero-Engine on Materials & Forming Technologies”; Antoine GAUGLER, Procurement Director, EADS , made an detailed report on the topic “ Airbus Material Procurement”, which talked about the domestic aviation materials and components will be more and more competitive. Another speech made by Jun ZHANG, Director, COMAC R&D Center, received extensive interests and attention from the delegates. Entitled “Development of structural materials and airworthiness requirements”, the report analyzed the specific needs of COMAC for civil aeronautical materials and airworthiness requirements. Other main domestic materials research institutes and research organizations also shared their views on the development of advanced materials and production ability in major aircraft projects. As the Chief Engineer Assistant of AVIC The First Aircraft Design Institute, Yuming JIA, reported the “Design technique of composite main structure for large civil aircraft”, which summarized the difficulties and achievements in the process of developing civil aircraft composite materials during the 5 years, and meanwhile revealed the some details of the design of double-aisle aircraft. The speech “Researching and development of commercial aircraft composite manufacturing technology” was another highly-concerned topic at the Forum, which indicates the double-aisle aircraft project has been officially approved not far from. Besides the theme speeches, the interactive discussion, one-to-one business meeting and roundtable talks also drew the attention of many representatives. The event lasted 3 days and the experts spoke highly of the achievements of the forum. The forum established a good platform for the communication and exchanges between as well as joint venture and cooperation of aeronautical materials and manufacturing enterprises both at home and abroad, and also played an active role in promoting and advancing the improvement and growth of aviation industry in China.